CMHS kicked off December with the 16th Annual Nightingale Ball on Friday December 1st at the Ojai Valley Inn & Spa. 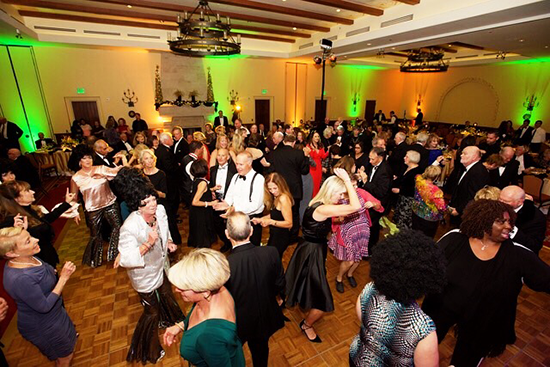 The “Motown Uptown” themed event brought the glitz, glamour and energy of the iconic Motown era to the Ojai Valley Community Hospital Foundation’s signature winter fundraiser. Upon arrival, guests posed for photos alongside a vintage Ford Mustang and walked the red carpet where many were greeted by the Supremes! The dinner program included Motown hits performed by RamFunkshus, multiple live performances by the Got Rhythm Dance Company, and a very special rendition of the Temptations hit “My Girl” sung by Dr. Jim Halverson and Dr. Ken Hartenstein. A special Motown dessert of Cream Puffs was served, topped with authentic Sanders Hot Fudge Sauce shipped especially for the event all the way from Detroit! A very special Thank you to our 2017 Nightingale Ball Chairs, Committee, Event Sponsors, and everyone who attending and made the evening a success! Click here to see the Motown Uptown photos! Information about air quality across Ventura County and recommended precautions can be found on the Ventura County Air Pollution Control District website at http://www.vcapcd.org/Forecast.aspx . Ojai Valley Community Hospital and its Emergency Department are secure, fully-functional, and accepting patients. The movement of our patients on Wednesday night was a precautionary measure – no mandatory evacuations were ordered and the campus remains safe at this time. We will provide an update once plans have been finalized to return patients to OVCH and our adjacent skilled nursing facility. If you have a question regarding an upcoming appointment or scheduled procedure at OVCH, please call 805-646-1401. Community Memorial Hospital in Ventura is completely operational and secure. For questions regarding appointments or upcoming procedures at CMH, please call 805-652-5011. San Buenaventura Urology and our outpatient clinic on Ashwood in Ventura are open and seeing patients. If you have an upcoming appointment at any of our outpatient clinics, or have questions about available providers in your area, please call 805-652-6353. For additional updates related to the Thomas Fire, please visit our Facebook page or http://www.cmhshealth.org/media/thomas-fire/. 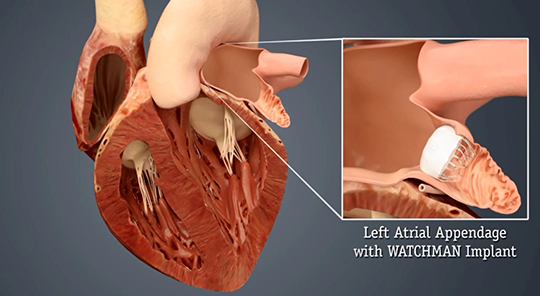 Community Memorial Hospital is the first in Ventura County, and among the first in California, to offer patients with non-valvular atrial fibrillation (AF) an alternative to long-term, blood-thinning warfarin medication with the newly approved WATCHMAN Left Atrial Appendage Closure Implant. Click here to watch the WATCHMAN procedure animation and learn more about device implantation and function. If you think you or someone you know might be a candidate for the WATCHMAN, ask your cardiologist or primary care physician to refer you to the Electrophysiology program at Community Memorial Hospital for a consultation. At midnight last night, Community Memorial Health System made the decision to transfer the majority of our patients at Ojai Valley Community Hospital and our adjacent skilled nursing facility. Although the fire never directly affected OVCH, the fire department advised us that the situation across the Ojai Valley was very fluid, and a shift or increase in the winds could impact our facilities. At the time, plenty of transportation and assistance was available, so we made the decision to move our non-ambulatory patients. A total of 48 patients were transferred to Community Memorial Hospital in Ventura and are resting comfortably. 27 patients remain safely at Ojai Valley Community Hospital. Our skilled nursing facility (The CCC) has been completely vacated at this time. Currently, Ojai Valley Community Hospital and its Emergency Department are fully operational. If you have an upcoming appointment at any of these locations, or have questions about available providers in your area, please call 805-652-6353. For additional updates throughout the day, please visit the Community Memorial Health System Facebook page. Currently, Community Memorial Hospital in Ventura has not been affected by the Thomas Fire and is safe and secure. No evacuations have been initiated. If you have a question regarding an appointment or scheduled procedure at Community Memorial Hospital in Ventura, please call 805.652.5011. The Ojai Valley Community Hospital campus is also safe and secure. No evacuations at this location have been initiated. If you have a question regarding an appointment or scheduled procedure at Ojai Valley Community Hospital, please call 805.646.1401. If you have an upcoming appointment at any of these CFH locations, please call 805.652.6353. Please visit our Facebook page for additional updates throughout the day.